refurbished, cleaned and tested by the seller. controller stick is tight. please check the detail for more information. 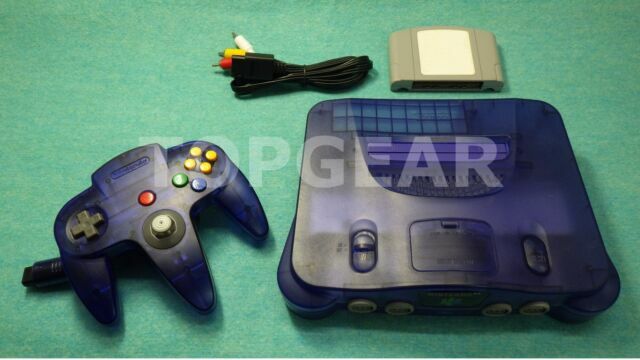 Nintendo 64 console Midnight Blue. New av stereo cable (not Nintendo). stick is tight. Sorry we only have the original AC adapter which is only playable in Japan. The operation is good. Jump into the world of vintage gaming with this cool and classic Ice Blue Nintendo 64. These limited collector's edition N64 consoles combine powerful engineering with an ice blue case. The see-through plastic allows you to observe the inner workings of your Nintendo console while imparting on it a glacial look. Get out your old game cartridges and accessories and get ready to jump into the virtual world of Nintendo. On this classic console, you can play memorable games, such as Super Mario Bros, GoldenEye 007, and Mario Kart 64. Its advanced processor and graphics card ensured that it delivered an excellent experience to gamers worldwide. With this limited-edition Nintendo 64 home entertainment device, you can explore an awesome 3-D world on a unique console in your very own living room. Featured in this blue console is Nintendo's 64-bit central processing unit. This exclusive piece of hardware allows for more advanced, realistic gameplay than what was previously possible. The processing chip juices up the gaming system and allows you to immerse yourself in realistic graphics and advanced 3-D gameplay. You can even increase your N64's internal memory for a faster and higher-quality game. Equipped with 4MB of RAM by default, this gaming system can be upgraded to 8MB of RAM through an Expansion Pak. The most innovative feature of this Nintendo 64 unit is the analog stick on the matching controller. The analog stick made it possible for players to aim their cursors accurately. The N64 allows you to connect up to four controllers, allowing you to enjoy multiplayer modes on your favorite Nintendo games. This limited-edition Ice Blue N64 is stylish and sleek, and the featured accessories include a matching ice blue controller. The sturdy cartridges can withstand the test of time, so you can play them even decades after their creation. Thanks to the 64-bit graphics and 24-bit color of the Nintendo 64, you can experience beloved characters in all their original glory. Nintendo 64 OEM Blue Controller. Works! item 2 Nintendo 64 OEM Blue Controller. Works! -Nintendo 64 OEM Blue Controller. Works! This Nintendo 64 was the best gift I ever bought for anyone, outstanding! I bought this N64 as a gift for my boyfriend, but being an avid gamer myself I've gotten a lot of use out of it too. Games don't always work and take a few tries to get going, but when they run they do so very smoothly. The console has never froze or lost any game data. The controller that came with it was in tip top shape and the joystick is very reliable! I love this console and so does my boyfriend. Brings me back to being a little kid, now I get to enjoy the same games on a great console. Love the color. Customer service was also very helpful. Packaged very well! I was impressed by the care put into this! Great job & great product! One of the best classic video game consoles ever created! The "ice blue" version is part of the limited Funtastic color series. It's see-through body creates a very unique gaming experience as well as addition to electronic appeal. One of the more highly sought after Funtastic versions also being one of the rarest colors. There is also a matching controller that came along with this console originally. Very neat overall! The system is in good shape the memory pak is also working. The controller is cracked on a couple of places and that wasn't mentioned in the notes. Also a cover panel is mission the bottom port of the system.